Boris Eifman is described in his company’s programme notes as a ‘choreographer-philosopher’ who wants to ‘draw spectators into the inexhaustible world of human passions’. His aim is to reinterpet the work of past geniuses to bring out their relevance to us today. So he overrides the nineteenth-century context of Tolstoy’s Anna Karenina in order to concentrate on the love triangle between Anna, her husband and her lover, Count Vronsky. The setting and costumes indicate no specific period. Anna’s frequent changes of outfit provide clues to her state of mind rather than her social status. The corps de ballet are not individuals but implacable forces, human and inhuman. Where Alexei Ratmansky’s Anna Karenina (seen here with the Mariinsky Ballet last summer) named 25 different characters, Eifman’s cast sheet lists just the three. All that matters is their passions: what the audience wants above all from a ballet performance, according to Eifman, is a catharsis, a deep emotional shock. But shocks come so frequently that the effect is of mounting hysteria rather than purgation. Anna (Nina Zmievets) is in lust as soon as she encounters Vronsky (Oleg Gabyshev) at a ball. Presumably his date, in white, is Kitty, but we don’t need to know that since there’s no secondary story. Karenin (Oleg Markov) is so jealous that he forces himself on Anna in bed: split crotch lifts, frantic Italian fouettés by her on her own, despairing arms. He’s even more of a marital bully once she’s publicly given away her craving for Vronsky at the races. Tolstoy’s Karenin is a pillar of rectitude, albeit a hypocritical one; Eifman’s is a sadist. Anna has to endure, or enjoy, so much flinging about that it can be hard to distinguish between her reactions: abandon, guilt, desire, regret… She’s literally swept off her feet by Vronsky in acrobatic lifts, swirls and upside-down clinches; when she returns home after a night of passion, she’s turned upside down again by wrathful Karenin. You can tell she’s conflicted by the black cloak over her white dress. The long skirt stretches so that she can accomodate Martha Graham contractions, deep pliés à la seconde and high kicks with flexed fleet to show her distress. Eifman’s choreography, though ballet-based, goes in for expressionist contortions. Karenin looks like a leaping tarantula in extraordinary jumps, feet tucked under him, before dashing himself to the floor, pounding the stage with his fists. By comparison, Vronsky is pallid, required mainly to respond to Anna’s surfeit of passion. He has his moment in the spotlight when he’s among his drunken fellow soldiers in Act II: he throws himself into the air before collapsing, presumably fed up with the way his adulterous affair is interfering with his military career. The male corps has fun as loutish soldiers, cascading against each other in a domino effect. 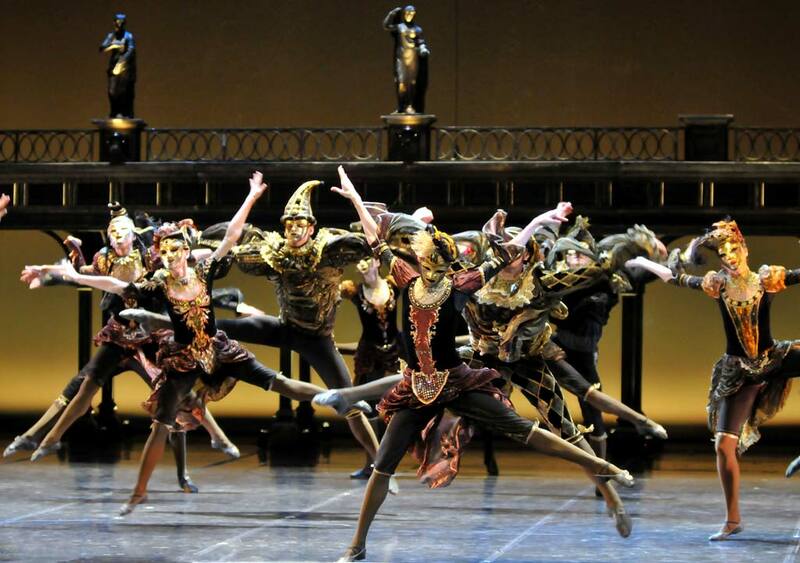 They’ve also been both horses and riders in the scene at the races, a device Ratmansky employs in his (later) ballet. Dressed identically in demonic black, the men are joined by the women for Anna’s doomed vision of the future as her son is taken away from her. She has an even worse trip at the end of the ballet when she takes opium and hallucinates a horde of squirming semi-naked bodies. They are transformed into a mechanistic marching regiment, lining up to become the train she hurls herself into/under. It’s a very effective coup de théåtre, even when you know what must be coming. Like Yuri Grigorovich, Eifman revels in bolshoi ensembles, interspersed with soul-searching solos and passionate pas de deux. He’s not interested in small steps, domestic intimacy or social niceties, so there’s little contrast or relief from melodrama. Yet when he does pause before ratcheting up the tension, he shows he can choreograph arresting scenes: the shared dreams of Anna and Vronsky, their restless beds spotlit in turn, their movements coinciding at a distance; an interlocked trio for Anna and the two men; a sinister Venetian carnival assembly, golden masks glistening in misty lighting. And he is served fearlessly by his dancers, from the anonymous corps to the three principals, hell-bent on dancing themselves and their audience into overwrought exhaustion. All this takes place to chunks of climactic Tchaikovsky (recorded) and ominous electronic sounds. It’s disconcerting to hear music associated with Balanchine’s Serenade and Theme and Variations in wildly different contexts, along with the storm music from Swan Lake, and haunting melodies from Souvenir de Florence and the Romeo and Juliet overture. Poor Pyotr Ilyich, mangled into modern psycho-drama: Eifman is the Ken Russell of St Petersburg. You can cry, snort in disbelief or go back to Eifman’s sources in the ninteenth century and make up your own mind whether they’re in need of updating.